Many nonprofits focus on donation streams like individual giving, grant writing, and special events. That means corporate partnerships often get left behind. Many nonprofits are making it a point to diversify revenue opportunities, and corporate social responsibility (CSR) partnerships offer a new direction. CSR is now a foundational pillar of the modern corporation, thanks in large part to the growing impact of Millennials and Generation Z. Today’s consumers seek to patronize socially responsible companies. A new generation of employees wants to work for organizations who participate in social responsibility. The win for fundraisers is that there’s a growing number of organizations looking to partner with nonprofits on structured CSR initiatives. Your team needs to have clear goals specific to your CSR program. There are a few ways to approach CSR programs, and without just going up to corporations and asking for money. While matching gifts is one of the easiest donation channels, you can also ask for grants, financial consulting advice, or even volunteers. Wayne Elsey and the Soles4Souls team developed a clear business plan for their organization, complete with impact, goals, and objectives. With this plan in place, the Soles4Souls team received a $20.3 million grant from the World Shoe Organization to help with their initiative. All winning teams need a leader, and strong CSR programs need a dedicated resource in charge. This gives your program credibility and accountability, and ensures that deadlines and milestones are met. Implementing a CSR initiative is similar to approaching individual donors. Start with a list of local or regional organizations that support local causes or have corporate philanthropy. Narrow down your list to organizations with missions or values in sync with yours. Prioritize your list to best fit organizations. Now it’s time to plan your pitch. Make sure you explain your cause and program clearly – when they have visibility into your initiatives, they’ll be more likely to support your efforts. Start at a macro-level that explains high-level goals, and then narrow it down to how you will work together. Talk about the bottom line success and how your program can help. Want to take your CSR efforts to the next level? Schedule a test drive of the OneCause platform today! Explain what’s in it for them. At the end of the day, these are for-profit organizations that are looking to increase ROI and deliver employee satisfaction. Share how your team will promote the partnership. Use social media, reach, and donor contacts to promote their brand and your partnership. Reciprocal marketing campaigns leverage both your nonprofit team and your corporate partners. Develop a detailed marketing plan and tailor it so corporations can tell that you understand their business and goals. This is also where you will share every avenue for getting their brand name out to the community alongside your CSR initiative, including social media, press events, and traditional marketing channels. Learn more about how reciprocal marketing can help take your CSR efforts above and beyond – take a test drive of the OneCause online fundraising platform now! Corporate executives want to know exactly how this new CSR program is impacting their business. This means gathering metrics around financial support, volunteer benefits, or in-kind donations. It should also be a standard practice to provide all your CSR partners with a formal report at least twice a year that gives a brief update on the program, goals, and other important details. PepUp Tech partners with some of the largest tech companies in the world to empower the next generation of tech leaders. The nonprofit hosts events and fundraisers with some of its corporate partners to help build a more diverse workforce, improve their products, and move the needle. With timely, accurate project reports and updates, both PepUp Tech and their partners know exactly how this CSR initiative is impacting their bottom line. Corporate giving increased 8% in 2017, and this number will only grow in the coming years. If you’re not taking advantage of CSR partnerships, you could be missing out. 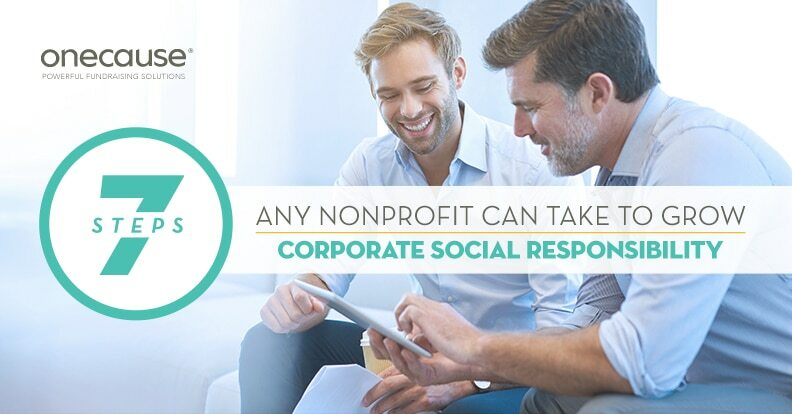 Learn how to start a successful CSR program in your nonprofit – download our guide, “A Nonprofit’s Guide to the World of Corporate Social Responsibility” today! Interested in more CSR resources? You’re in luck!